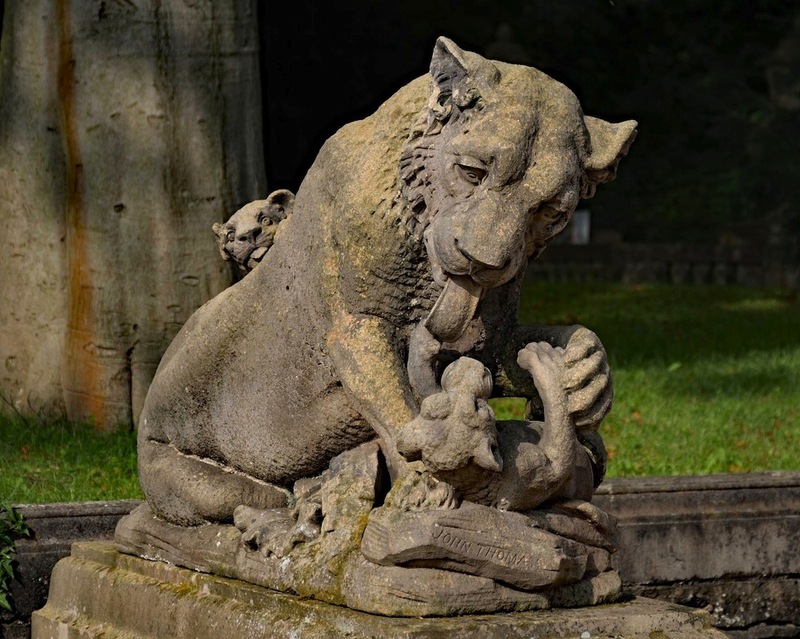 Lioness with cubs at Thornbridge Hall, Derbyshire probably carved by John Thomas (1813-62; it should also be borne in mind that there was at least one other sculptor called John Thomas — notably the Welsh sculptor John Evan Thomas, 1810-1873). This naturalistic lioness, licking one cub while another peers playfully over her back, is very different from the majestic sphinx-like lions which were definitley carved by the former John Thomas, a pair of which guard each end of the Britannia Bridge in North Wales. Left: Close-up of the playful cub at the lioness's back. Right: Close-up of the lioness licking the other cub, and the sculptor's signature. Thornbridge Hall had originally (from the twelfth century) belonged to the Longsdons of Little Longstone. They had held it until selling it in 1790. But it was sold back to them in 1859, upon which the Longsdons kept most of the estate but resold the Hall itself, and its immediate grounds. Perhaps it was at this time that the lioness was installed. In 1871, the Hall was sold again, and rebuilt, with some very fine contemporary input — including stained-glass windows by William Morris and Edward Burne-Jones. However, it was when the Hall was sold again in 1896 that formal gardens were laid out. 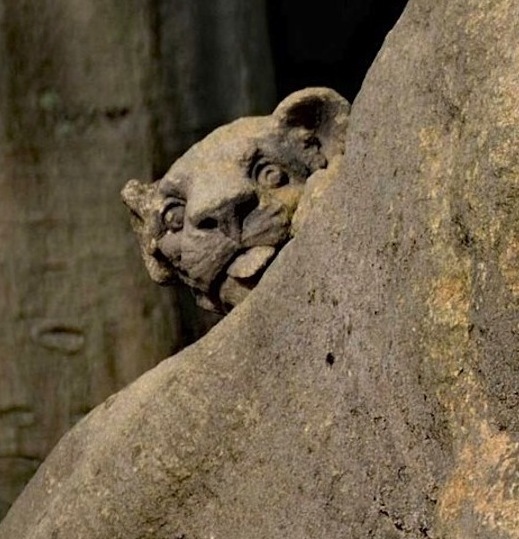 It could be that John Thomas's stone lioness was bought in at this time. But Mike Critchlow, who photographed it, says: "Much of the garden sculptures were imported by Henry Boot during the 1930s from Clumber Park (and Derwent Hall/ChurchLike the Hall itself," so it might have come in later still. These gardens are now Grade II listed, and contain many sculptural pieces. "Thornbridge Hall: List Entry Summary." Historic England. Web. 22 December 2016. "Gardens at Thornbridge Hall: List Entry Summary." Historic England. Web. 22 December 2016.